Tall, bearded and covered in soot, Ben Noffsinger greets me and leads me into his shop. Hidden in a small garage behind a scattering of kayaking supplies, his workshop is a strong contrast to the typical things you will see in Dare County. This workshop is Nafzger Forge, and it is here that Noffsinger works as a bladesmith crafting knives. Noffsinger looks the part, but that may be the end of where the blacksmith of reality and imagination merge. It became apparent that the image of sparks flying as hammer meets metal followed by a sizzle and steam rising as the iron cools in water are not the defining features of his work. Instead, the skills of an artist — precision and great care — were the ones that were most fascinating. 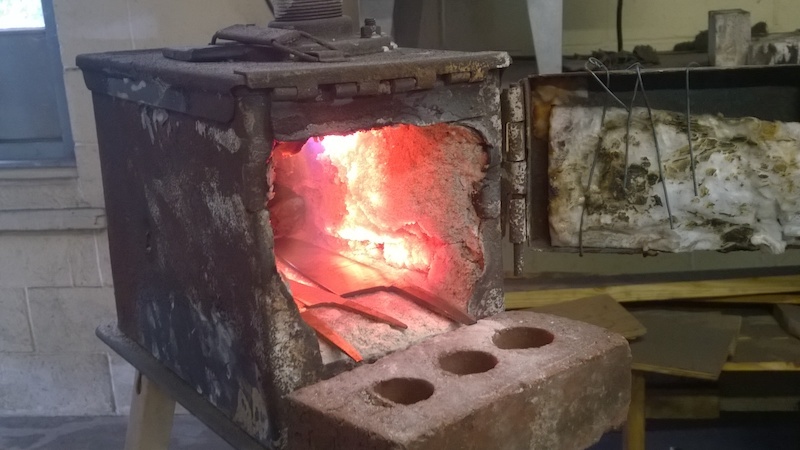 He removed orange-hot steel from his forge and placed it on his anvil. One strong, well-aimed smash of a hammer branded the steel with the Nafzger Forge insignia. 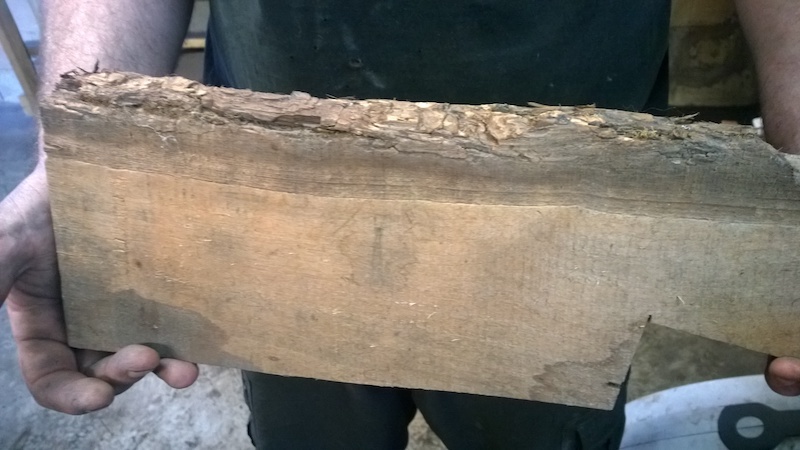 He then carefully inspected the steel lengthwise for irregularities and carefully hammered them straight. Noffsinger grew up in Manteo. His father relocated here from Raleigh to work for the U.S. Fish and Wildlife Service. The natural world has played an important part in his life, and he enjoyed hunting, fishing, camping and other elements of rural society that are often idolized. In school, he gravitated toward Scandinavian and Medieval history, culture and mythology. He was a strong and gifted student and completed high school at the North Carolina School of Science and Mathematics and went to N.C. State University to study wildlife science. Throughout this time, he was interested in blades and crafting, but those interests were largely restricted to his imagination, video games and backyard misadventures. After N.C. State, Noffsinger began to work at The Red Hen, a farm-to-table restaurant in Lexington, Va. The philosophy of local production and sustainability had a profound effect on him, and the idea came to him that the knives he was using were something that he could make. He feels that there is an appeal in both using a handmade product and knowing who made it. Noffsinger began to research bladesmithing online and found an open and tight-knit community. His interests were shared and embraced and he found the support he needed. “The online bladesmithing communities told me that I could do this,” he said, so he took some initial steps into becoming the craftsman he is today. He bought an anvil and got in touch with a person who could help him make his own forge. 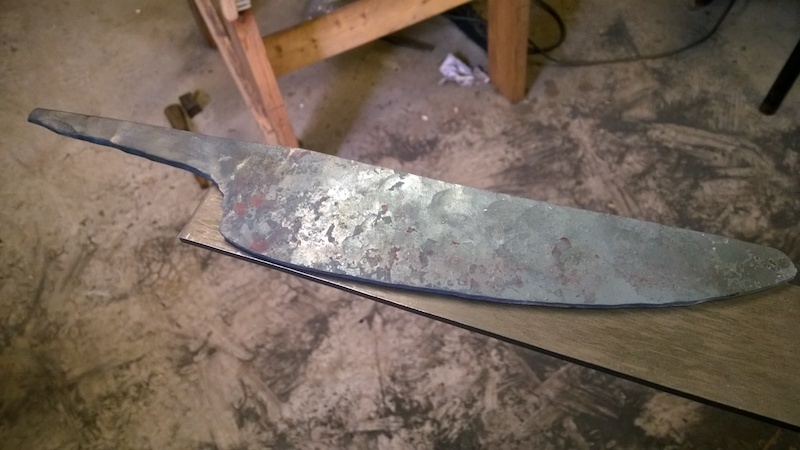 The skills were hard to learn at first, but the online bladesmithing communities gave him the answers to his questions, explained complex steps and helped him correct his imperfections. In 2012, Noffsinger sold his first knife for $100 to a chef in Lexington. 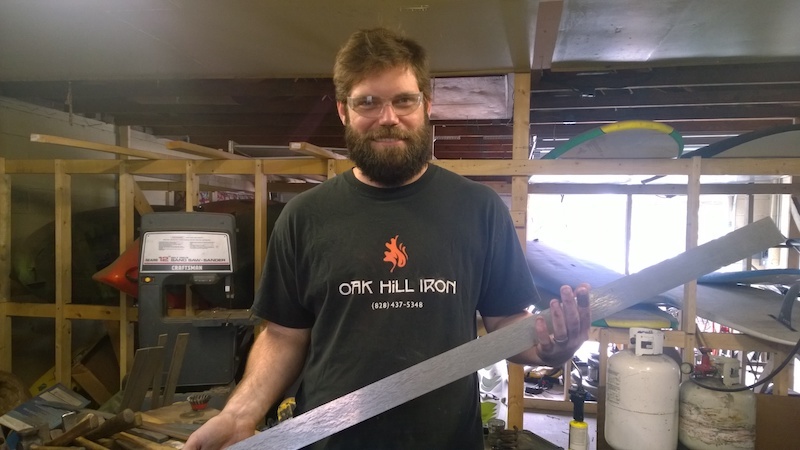 In 2013, he moved to Morganton, N.C. and took a full-time job as a blacksmith working for Oak Hill Iron. 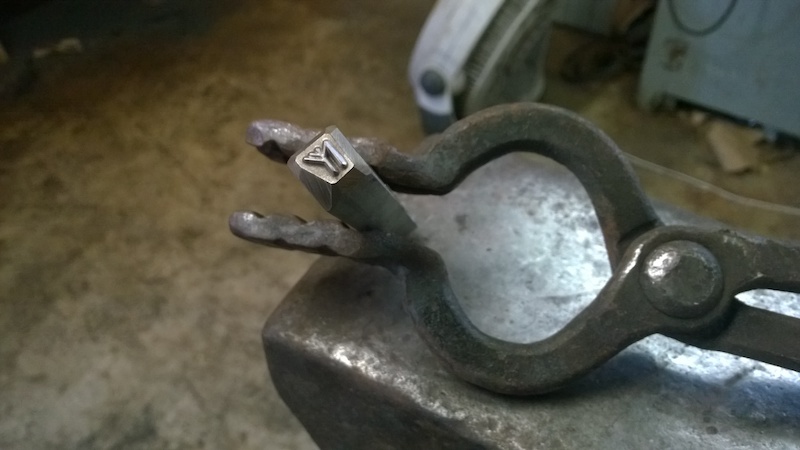 The same year, his Nafzger Forge stamp came in and his business began to take shape. At the End of 2015, he was selling two to three knives a month, and bladesmithing became his full-time job. Today, he is selling 10 to 12 knives a month and he has shipped his knives as far as New Zealand. I ask Ben about the blacksmiths and bladesmiths that use their skills to craft art objects and movie props. Ben explains that he was always interested in their work, but the fact that knives have practical use is one of his primary motivators. “If the things I made were not useful and practical, it would feel foolish.” Noffsinger explains that chefs are “one of the last remaining professions that relies on a blade,” and he sees his bladesmithing as an effort to keep this human history alive. A knife from Nafzger Forge can run from $150 to the mid-$300s. The costs may seem prohibitive to some, but Noffsinger says the prices are very competitive to similar handmade products. But more importantly, Noffsinger wants his customers to be of a mindset that you are making an investment when you purchase one of his knives. Not just an investment in the knife itself, but an investment in an ideology that you should know where the things you buy come from, that your purchasing power should support communities and families from the grass roots and that you are honoring an important part of human history and culture.